The Solar System had long ago been colonized by an Earth suffering from a dwindling food supply and a millionfold increase in population. The colonies were her very lifeblood. Without hte daily flow of products from them, Earth would experience mass starvation and chaos within weeks. Suddenly and unexpectedly, reports of fatal food poisoning, traceable to Martian produce, began to reach the ruling Council of Science. Each new case was treated with intense secrecy for if the people of Earth learned the cause of these deaths, a worldwide panic would surely ensue. To David Starr, Space Ranger, these deadly incidents formed a terrifying pattern—they were clearly part of a clever and brutal scheme by an alien conspiracy to cripple Earth’s economic life and topple its government! This is the first of the six “Lucky Starr” novels, originally published in the 1950’s under a pseudonym as (it was hoped) the basis for a TV series. Here we’re introduced to David Starr, the youngest person ever to become a full-member of Earth’s all-important Council of Science. He’s an orphan, his parents having been killed in a pirate attack, and he’s been rasied by his father’s two best friends. He’s smart, athletic, and good looking. What a guy! Meanwhile, Earth is having to deal with a series of poisonings, all seeming having to do food shipped to Earth from Mars. (Earth, after all, cannot grow enough food to support its whopping population of five billion [sic!] people.) David heads off to Mars to try to find the villains behind the poisonings. Will he succeed? Along the way, David acquires a sidekick in the form of the (short—this is important!) John Bigman Jones. Mysterious energy beings who live under the Martian surface also give him a mask that obscures his identity and grants him invulnerability to any weapon. They also name him the Space Ranger. 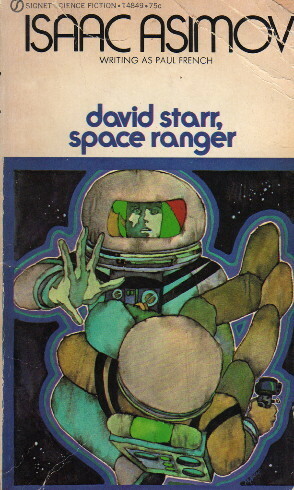 Even though David Starr: Space Ranger has the burden of setting up the entire series of novels, it does so quite well. A large chunk of the core exposition is handled in the form of a flashback in the first chapter. There are also detailed descriptions of the Martian surface and the technology involved in Martian life, but they’re handled smoothly and are not at all obtrusive. David Starr: Space Ranger belongs to that subgenre of sf, the Space Western. When done badly, it can be very silly, but when done well, it can be a lot of fun. This one is done well. Even though the rough and tough men David has to deal with are farmboys in name and glorified mechanics in fact, and even though there isn’t a herd of anything in sight, the basic social structure and the feel of the story come straight from westerns. As is generally true, Asimov is stronger at world-building than characterization. The named characters tend to be pretty obviously good guys or bad guys, and the only real plot twist that comes our way is that one (and only one!) of the sympathetic characters turns out to be a bad guy and, indeed, the villain of the piece. David himself always seems somewhat enigmatic; he's a little too perfect to be believable. Bigman, however, is one of my favorite Asimov characters. It's particularly interesting that, although he acts as the book’s comic relief, he never loses his dignity. You still respect him when all is said and done. 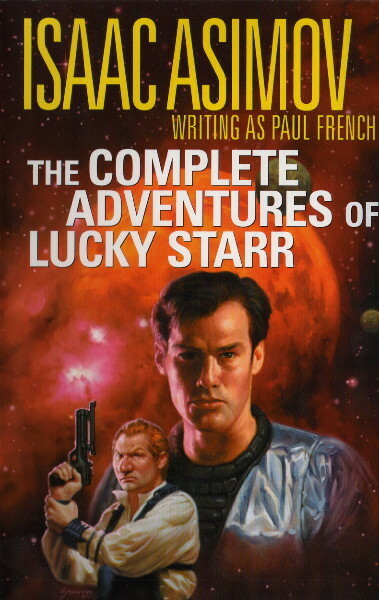 Like the other “Lucky Starr” books, this is not Asimov at its best, but it’s still a pleasant read even if one is over the age of twelve, and it is still worlds above anything that TV would have produced at the time. Maybe now, though. Hmmm, I wonder if Joss Whedon is up to anything…?